January 1st What to do with that old Christmas tree ? Insulate perennials. Cut off some of the boughs and lay them over perennial beds to insulate them from the snow and frost. Toss it in the garden. Make sure to clean any plasic or garland off the tree then toss it in the corner of your yard or garden. It makes a great place for birds and beneficial insects to hang out. Compost it. Cut it into as small peices as you can and put it in your compost pile. Coasters. Cut the trunk into thin slices and sand them down to create unique coasters. If sap is coming out of the tree pieces, paint a thin layer of polyurethane over them. January 3rd Take care of yourself. When you buy tools, it pays to purchase quality. Remember: thrift and frugality are about obtaining value for your dollar — not just paying the cheapest price. In the long run you will be happier. There is nothing more frustrating then tools that break or don't do the job they are supposed to do. a 99c hand trowl won't last the season, but an $8.00 one will last a lifetime. Overall you need very few tools so buy quality not quanity. January 5th Its time to start planning your garden. New gardeners should start small with about 100sqft garden ( 10'x10') the average garden in the US is about 600 square feet so you have a goal to work up to. Get some graph paper, a pencil and ruler to plot your garden on. Also find the sunny spot in your yard. Make a list of what you want to grow. You can find spacing charts online. Plan where things will go on paper. Remember tall plants on the north end and shorter ones on the south end so the taller plants will not shade out the shorter ones. January 6th Here is a great winter project. Paint the handles of your gardens tools a bright, color other than green to help you find them amongst your plants. You can also keep a mailbox in your garden for easy tool storage. January 8th Garden Planning Tip: How do you know what varieties of seeds and plants to grow in your garden? Many times you are looking at a seed catalog or online seed source, and just like the menu at the restaruant the picture and description do not always match what you get. Thats why I will ask the waitress or waiter for an suggestion which works 9 times out of 10. How does this work with seeds & plants. Here are some suggestions. 1. Many seed websites have feedback, Baker Creek is a good example. They have customer feedback and I always read the real life feedback. 2. Buy from local plant dealers that either grow their own or have a good relationship with there suppliers. Next ask them what they think works best. I love Martins Greenhouse on Western Ave, and several plant sellers at the South Bend Farmers Market. 3. Ask the farmers at the Farmers Market or someplace like Matthy's Market what seeds they use on the farm. I don't mind taking some risk but its good to know what has worked or not worked for others in the past. January 10th Growing Up: As you plan your garden use space wisely by going vertical. Cucumbers & Pole Beans grow great up fences. Be creative using an old swing set to grow up....Think outside the box. May 31st Save eggshells let them dry out then grind them up in a blender and put them in the hole you plant your Peppers, Tomatoes, and Eggplant. You can also sprinkle them around plants or make an eggshell tea to pour around plants. If you decide to make tea its best to wash out egg residue inside shell then let dry. Fill a bucket with 50% crushed shells and 50% water. Let set for a week then pour around plants. This will add Calicum to the soil. Tomatoes, Peppers, and Eggplants love Calicum. 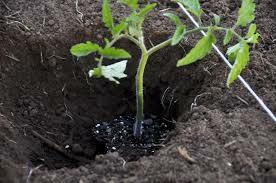 June 1st When transplanting tomatoes, cover the stem with soil all the way up to the first set of leaves. This greatly encourages root growth, making a stronger, healthier plant. June 8th Water your garden in the early morning to conserve moisture loss and to help avoid powdery mildew and other fungal diseases that are often spread by high humidity levels. Don't over water it is easier to revive a dry plant then to dry out wet roots. Before watering take a soil sample 6" down to see if soil is dry. Water deep about a inch of water will do. October 1st Some vegetables actually become better after a first frost, including kale, cabbage, parsnips, carrots, and Brussels sprouts.